Ireland’s parliament passed a landmark legislation to make abortion legal for the first time in the Catholic-majority country, a “historic moment” which came after an Indian dentist died from blood poisoning in 2012 when the doctors refused her repeated requests to abort the foetus. Ireland voted decisively to change the Constitution to repeal the Eighth Amendment in May, with 66.4 per cent voting in favour of new legislation to allow for the termination of pregnancies. “The bill that allows for the introduction of abortion services in Ireland has passed all stages of the Oireachtas (Irish Parliament) and will now go to President Michael D Higgins to be signed into law,” Irish Broadcaster RTE reported on Thursday. “Historic moment for Irish women. Thanks to all who supported and well done to (Health Minister) Simon Harris for steering this through both Houses,” Ireland’s Indian-origin President Leo Varadkar said. The new development has come following a rising number of distressing stories about women unable to get an abortion in Ireland. 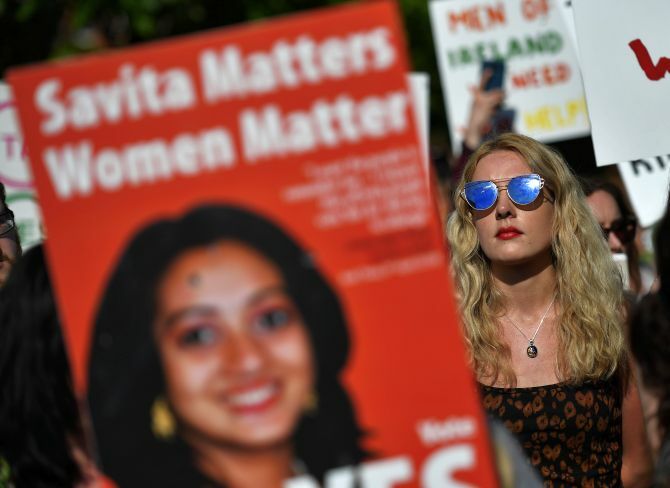 One of the high-profile cases was that of 31-year-old Indian dentist Savita Halappanavar, who died in agony from blood poisoning after doctors refused her repeated requests for an abortion while she was having a miscarriage at a Galway hospital in 2012. Her death helped “personalise” the debate around abortion, said a legal scholar at Trinity College Dublin. “This is a genuinely historic moment. It paves the way for the implementation of the service for termination of pregnancy in January 2019,” said Minister Harris. Two different doctors will be allowed to assess a woman in early pregnancy and the offences section has been moved from the front of the bill, the BBC reported. “I want to thank the campaigners who fought for 35 years to change a nation, to change hearts and minds. I want to thank the minority who fought the battle in here when it was convenient for the majority to ignore. “But today, I think mostly of the thousands of women who were forced to make the journey to access care that should have been available in their own country,” Harris said. Ireland is a Catholic-majority country with about 80 per cent of Irish people describing themselves as Catholic in the last census in 2016 even as the influence of the Church has waned in recent years. Varadkar, a 39-year-old Indian-origin doctor, scripted history in June last year by becoming Ireland’s youngest and the first openly gay prime minister of the Catholic-majority country, as he promised to build “a republic of opportunity”. What's the ideal age to plan a pregnancy?